Giving back has been a lifelong passion for Paul Smith. The 84-year-old Parkway Place member spent more than 30 years as a missionary in the Middle East, and he now dedicates his time making wooden chairs and toys for children in need. Smith spends his time in the workshop at the senior living community perfecting a craft he finds extremely gratifying. So far, he has made nearly 30 chairs and dozens of toys that he has donated to children. The chairs require no nails or screws and fit together like a jigsaw puzzle. They were originally called “puzzle chairs,” but Smith renamed them “gospel chairs” because a cross pin holds each one together. A lot of hard work and dedication goes into each chair, which takes Smith about 12 hours to make. He then donates the chairs to local organizations. 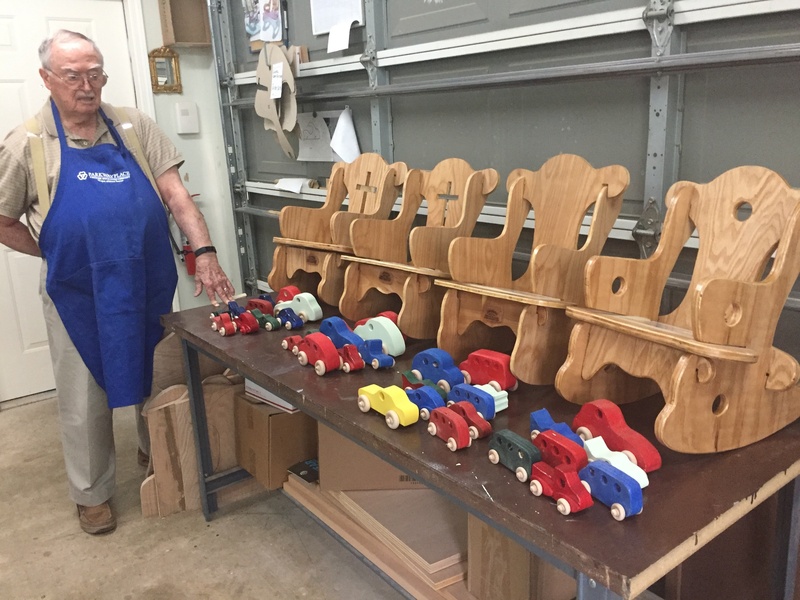 As for the toys, they are mostly wooden cars, and he donates them to the hospitality house at the Texas State Penitentiary in Huntsville so young children have something to play with when visiting family members. The workshop gives members like Smith a creative outlet for their skills and allows them to work on what they love or learn a new hobby while giving back to the surrounding community. Smith says woodworking is also therapeutic, and he plans to continue going to the shop as often as he can. The senior living community encourages members to discover their interests and engage in all the activities the community has to offer. At Parkway Place, members can enjoy delicious dining and warm fellowship in beautifully arranged dining rooms, as well as maintain active lifestyles at the wellness center. The community also has an on-site life enrichment coordinator, chapel, full-time chaplain, on-site worship services, beauty/barber salon and weekly housekeeping/linen service. For more information about Parkway Place, please visit the community website at www.bucknerparkwayplace.org or call (281) 677–5912. Contact: Chelsi Smith/Amy Jones, The Point Group. Love it! I have been to the Smith's apartment and seen the toy maker at work. Such wonderful people. How lucky are we ALL to get to spend life with such incredibly selfless people! I am adding the residents/friends we have at our communities as something I am thanking God for this week of Thanksgiving!